Home / Whole Food Healthy Recipes / vegan / Make These Healthy Holiday Recipes For Your Next Party! Make These Healthy Holiday Recipes For Your Next Party! by Sarah BakerLeave a Comment on Make These Healthy Holiday Recipes For Your Next Party! My latest segment on Windy City Live showcased healthy holiday recipes that you can make at your next event or holiday dinner party, check them out! The holidays are officially here and that means there is going to be endless opportunity to indulge and imbibe within the next month! Can you just imagine all the holiday parties and events there will be in the month of December? A lot of people wonder why they get that stingy winter weight gain, but when you think of it there’s a lot of damage that can be done by over-eating and drinking 3 too many cocktails or glasses of wine in such a short time period! If we’re not careful, come mid January we won’t even need cars – we can just roll wherever we need to go. BUT to prevent this from happening I’m helpin’ you keep that bod tight by sharing some healthier holiday entertaining recipes that you can make at your next gathering (or bring to your next event)! I stopped by Windy City Live to share healthy holiday recipes and talked about some of the nutritional benefits, but I’d like to discuss them in more detail here since I always run out of time from chatting too much on the morning shows. Now this is the easiest holiday party appetizer you could make. If you want to keep it very simple and you’re crunched on time, just swing on by a store and pick up pre-made guacamole and salsa. Find some whole wheat or gluten free bread, and fresh basil. I like to be conscious of the sodium levels in packaged foods so I made guacamole from scratch and I cooked diced tomatoes with onion, garlic and herbs. This is such a nutrient dense appetizer it’s not even funny. Besides being packed with fiber, avocado is an extremely healthy fat – containing monounsaturated fatty acids which are not only good for heart health, but also your hair skin and nails. It keeps your skin soft and supple (which we need during the winter months in Chicago), our hair shiny and our nails strong. Another interesting thing to note about avocado is that when paired with other plant based ingredients, the fat in avo helps you absorb fat soluble vitamins like A, D, E and antioxidants like carotenoids at a better rate! This is why I also added tomatoes to this appetizer because tomatoes contain all four major carotenoids, one that I’d like to point out being lycopene which is another fabulous beauty boosting antioxidant. Carotenoids are plant pigments that act as antioxidants and can protect you from chronic disease and inflammation. Lycopene is a carotenoid that is found primarily in tomatoes and it protects your skin from UV damage and aging. Yet it is important to note that you will get better levels of lycopene when you cook your tomatoes. Studies have shown that when you cook tomatoes, the lycopene levels are enhanced. 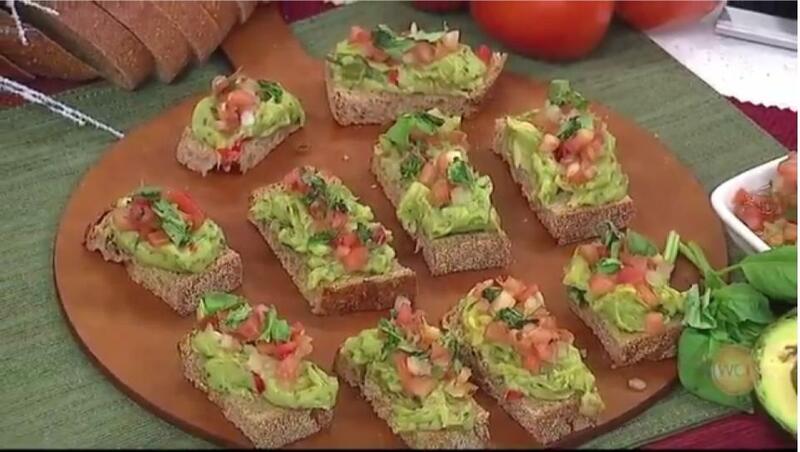 So pretty much each crostini is like a mini edible facial for your skin. Who needs expensive creams when you can just eat foods to protect your skin! I shouldn’t even call these meatballs since there is no meat. Let’s go with mushroom-balls. It sounds weird but hey, what can ya do. Anyways, I’ve made these mushroom-balls before and I’ll make them again. It’s a great way to impress your guests with an appetizer that is completely vegan. My all star meat substitutes in this is quinoa, lentils, and mushrooms. I pulse all these ingredients in a food processer, add some almond meal and nutritional yeast to help hold the mix together. Then for seasonings I use rosemary (cause it smells so dang good), worchester sauce which really gives it that earthy savory flavor, and additional seasonings for flavor. Bake them in the oven for about 25 minutes and you’re good! If you’re thinking, where will I get my protein!! Well girlfriend, there’s protein in these mushroom-balls. Complete protein to be exact. The important thing to note when you’re conscious about protein in your food is to ensure that whatever you’re eating is a complete protein. 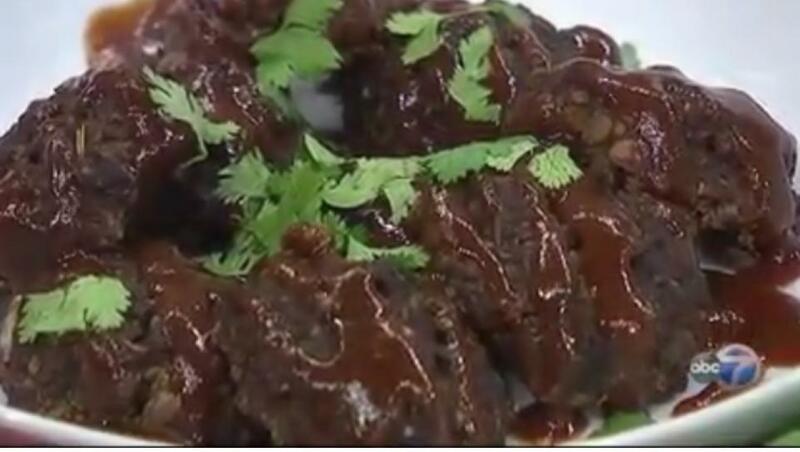 This is easy if you eat meat because most animal proteins are complete proteins: meaning that it contains all essential amino acids, which are the building blocks of protein. But not all plant based proteins are complete. This means that we need to combine specific foods together to ensure that we are getting all nine amino acids. Between the quinoa and the lentils in these mushroom- balls, you’ll be getting complete protein – so there you have it! For this recipe I take my leftover lentils from the mushroom-balls and create a hearty taco filling for my festive tacos! 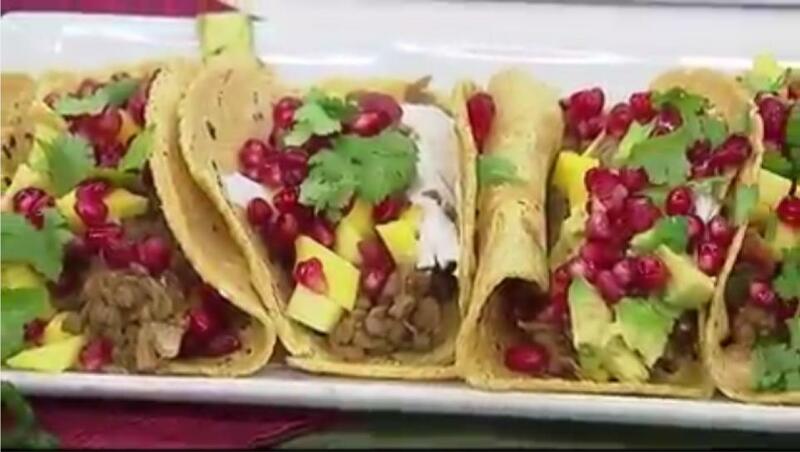 To make this recipe festive for the holidays I top each taco with avocado, mango, and pomegranate seeds (red and green for Christmas, holler). If you must have meat in your tacos, you can use shredded chicken or mahi mahi instead while keeping all other ingredients the same. I obviously like to use plant based proteins in my recipes just to show how easy it is to eat vegetarian or vegan. This recipe focuses on macronutrients – we’ve got whole grain tacos, healthy fats from the avocado, and protein from the lentils. Macronutrients is simply the emphasis on ensuring that we get enough protein, fats, and carbs in our diet. So if you’re trying to start with the basics when eating healthy, make sure that you’ve got these three key nutrients at every meal. The carbohydrates don’t have to necessarily come from grains either, veggies contain carbs too! This is my FAVORITE healthy recipe!! And it’s a dessert – so double whammy up in here! This cinnamon berry crumble is grain-free, gluten-free, dairy-free, and pretty much free of everything you want it to be. The filling is made of fresh berries, lemon juice, vanilla extract, and brown sugar. 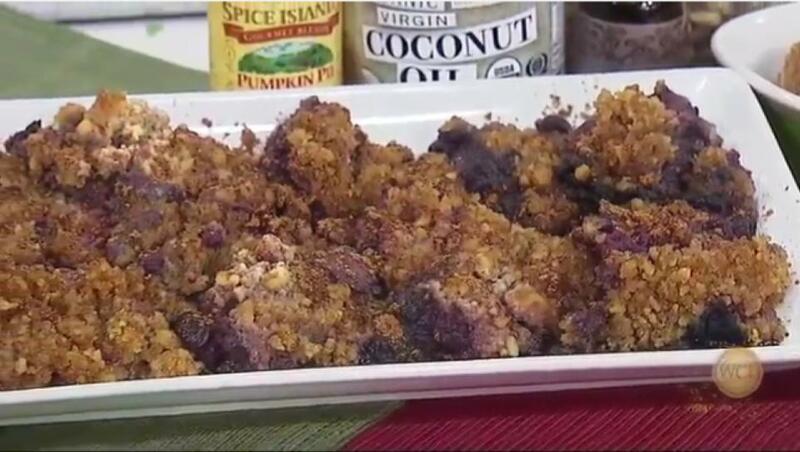 The crumble is a blend of coconut flour, walnuts, flaxseed, solidified coconut oil, and more brown sugar and vanilla extract. The coconut flour is what makes this crumble gluten and grain free. Coconut flour is simply powdered coconut meat so not only is it gluten-free, but you’re getting fiber from this flour! Benefits in a dessert, who knew? Between the walnuts and the flaxseed you’ll also be getting healthy fats again (especially omega 3), and a burst of antioxidants and vitamin C from the berries. The way I look at it, is that there should always be some sort of benefit you get from everything that you eat. Even from desserts! 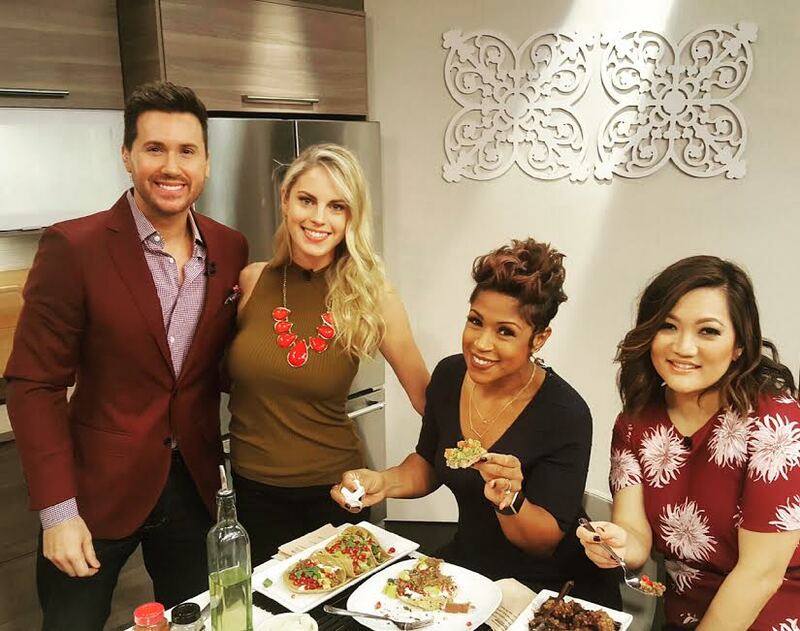 Sooo if you want to make all these delicious holiday entertaining recipes, head on over to the segment page on Windy City Live to grab them and watch the video again if you want to see me making fun of how host Ryan shapes his mushroom-balls :-). Toota – loo!